It's Las Vegas! You're so money, baby! I spent the first few days of this week in Las Vegas on business, though I did find a little time to get out and shoot, both with the Nikon and of course with my trusty little sidekick, my iPhone. It has been a couple of weeks since I shared some iPhone pics, so I thought I could give you a little tour of The Bellagio. The Bellagio is an incredible hotel/casino located right at the heart of The Strip in Las Vegas, NV. If you ever make it to Las Vegas, be sure and stop into The Bellagio, even if you are staying elsewhere. It’s just a beautiful property. It's fun just to walk around and see it all (and take some pics, too!). One of the most well-known parts of it is the big lagoon out front, which hosts a water fountain show ever day. It’s pretty awesome, though I was shooting all these pics in the morning (my preferred shooting time, especially in Las Vegas when all the tourists are asleep), so it was relatively calm. 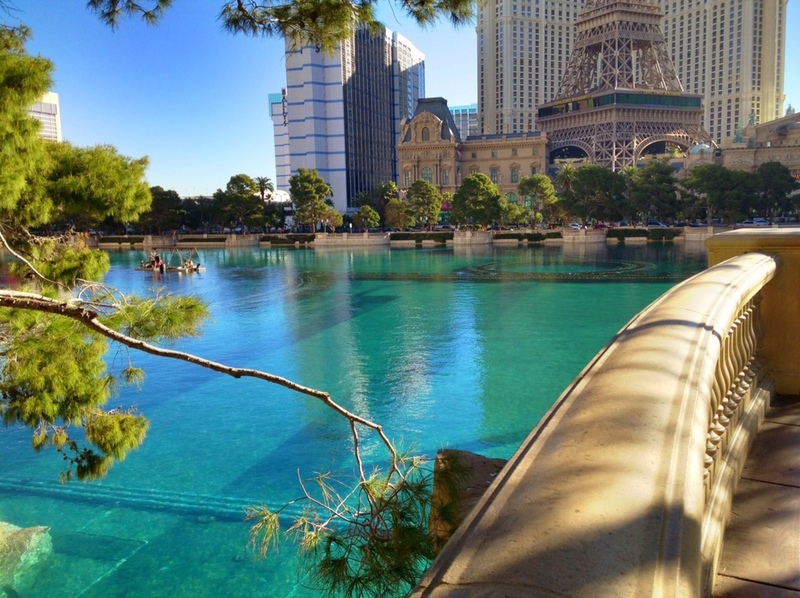 This view is sideways across the lagoon, and you can see just the left edge of The Bellagio, then Flamingo, Bally’s and a smidge of Paris on the far right. I am always looking for still water to get some reflections. 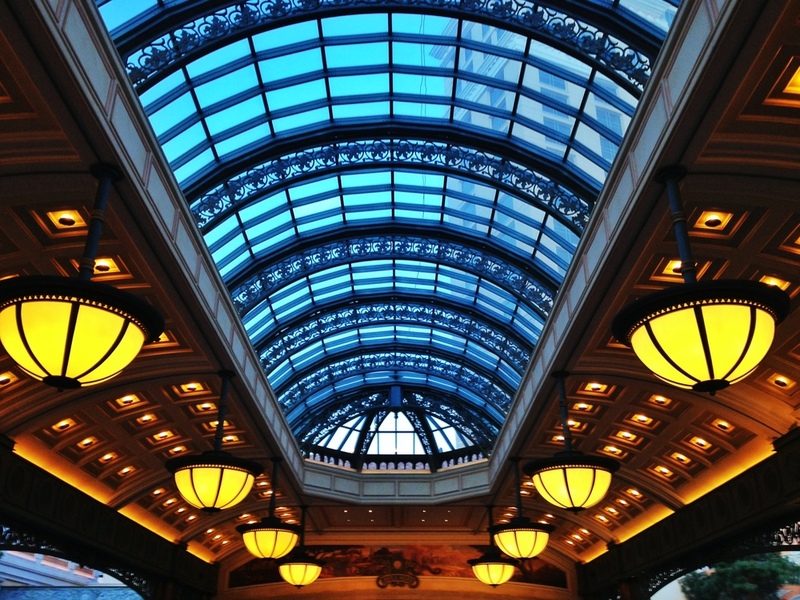 As I was walking up to the Bellagio entrance, I looked back and just liked this view. At this point the Bellagio is behind me, and I am looking out across the lagoon, where you can see the Paris Hotel and the bottom of their Eiffel Tower. I stayed in Paris this time - pretty cool spot. And the nutella/banana crepes were fabulous! This is the covered drive-up entry to The Bellagio. It’s a grand entrance, but being rather busy (even at an early hour) I opted to focus here just on the ceiling, which is beautiful. Once you enter, one of the first things you will see in the lobby is this wonderfully colorful ceiling full of glass done by artist Dale Chihuly. It’s impressive! I walked through the lobby, and there was a huge display set up for the Chinese New Year which is right around the corner. It’s the year of the snake...so they had this massive snake on display, along with a bunch of other stuff like flowers, a boat (!) and a Chinese money tree. The shopping in The Bellagio is rather expensive extensive but thankfully the stores were all closed. I just grabbed this shot of the hallway, as I found it pretty inviting. So much attention to detail here! 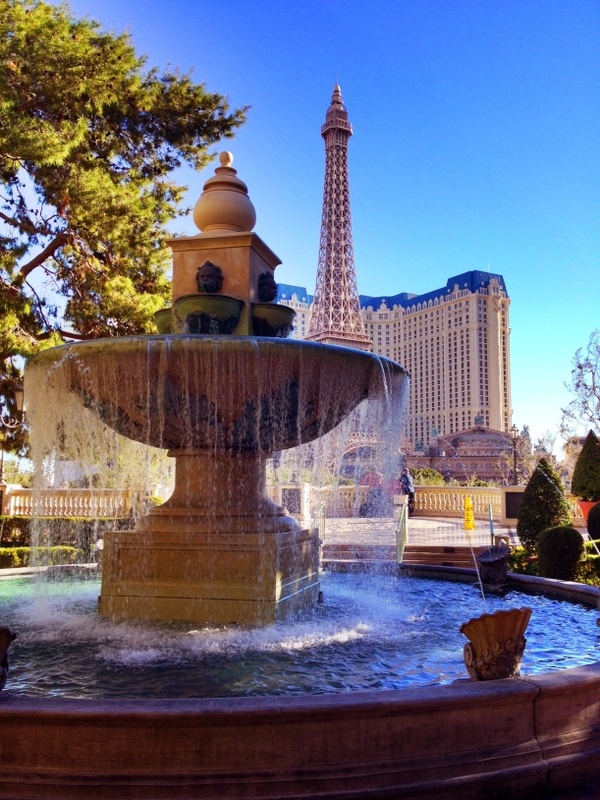 Lastly, I walked back to the front of The Bellagio to head out, and stopped to shoot this fountain, with Paris in the background. Well, that’s a quick tour of The Bellagio in Las Vegas! I will be sharing my Nikon pics of this place too, as I find time to process them. Thanks for having a look!